Rosalie Anderson ‘Andie’ Macdowell, actress, model and mother who is recipient of the prodigeous Goldene Kamera (the Germans adored her performance as Dorothy Winters, alongside the divine John Travolta in MICHAEL (1996)) and an Honorary César (who’s previous recipients have included Jean-Luc Godard, Steven Spielberg, Bette Davies and Walt Disney), has had a long and distinguished career working with some of the finest auteurs in modern cinema, and more latterly, as a staple of ‘made for TV movies’ for the Hallmark channel. She has proved a muse for the likes of Soderbergh and Altman who were drawn to her tabula rasa acting style where the audience can project their hopes, desires, pains and anguish upon her steadily crinkling fore-head. Roof-Dirk wrote a piece on GROUNDHOG DAY (1993) without mentioning her outstanding contribution to the comic genius of the screenplay. The straight-man is rarely acknowledged for their role in making the comedy work, especially when the straight-man is an attractive woman. It is a role she takes in GREEN CARD (1990), MULTIPLICITY (1996) and, most famously, FOUR WEDDINGS AND A FUNERAL (1994). Hugh Hudson’s painstaking period drama infuses Edgar Rice Burrough’s pot-boiler with Dickens. Here the nobel savage becomes a Pip Pirrip who is paraded through polite society as an entertaining novelty. MacDowell is the love-interest who shows empathy for Tarzen and tries to civilise him through an immersion in cultural activity such as fine-dinning and French. Her southern drawl proved less convincing than the puppet monkeys, so her voice was dubbed by Glen Close in post-production. Bo Derek was always going to be a hard act to follow. I have grown to appreciate this film as time as gone by, I didn’t like it at first because the critical reception was so overwhelmingly positive that it failed to live up to expectation. There is no doubt that it reshaped the state of independent cinema in the 1990s. It was also responsible for launching MacDowell’s career as she was critically lauded and received a number of high-profile prize nominations. She plays a suburban woman who is seeking the sexual satisfaction she has failed to find in her unhappy marriage to Peter Gallagher. She discovers James Spader’s strange VHS collection featuring the sexual confessions of women and it awakens a renewed confidence within her. MacDowell’s impenetrable expression is perfectly suited to the role and there is something unattainable yet common-place about her look. MacDowell plays the mother of Casey, a little boy who is knocked down by a car. She is terrorised by phone-calls from Lyle Lovett, a baker who has made a birthday cake that wasn’t collected, due to the accident. MacDowell gives a very brittle, sensitive performance as she explains the reason for her lack of contact to the baker. A, Small, Good Thing is one of my favourite Raymond Carver stories. She’s better than Julia Roberts in NOTTING HILL (1999). I’m struggling a bit now. 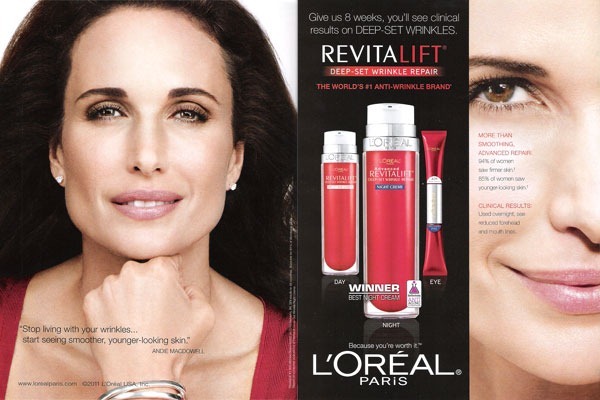 She has been a long-term spokesperson and ‘face’ of L’Oreal since the late 1980s. There’s always controversy about overly photo-shoped, air-brushing and I am not really going to pass comment. The best Andie MacDowell performance is the ice sculpture version of Andie MacDowell that Bill Murray creates in ‘Groundhog Day’. The irony is she always seems very likeable and funny in real life. Except when she’s playing herself in ‘The Player’, of course. She must have done SOMETHING right because she ‘s so well respected within the industry. I’ve saved HUDSON HAWK for a future “magnificent failiures” five. I’ll confess, I’ve never seen Hudson Hawk. If I ever make it to a Dirk night I’ll buy the Blu-ray specially.